The world of cryptocurrencies is growing continuously, more and more people join this world that is growing more and more on the basis of technology. Many people are investing in cryptocurrencies but this is a complicated and tedious job, as investors must navigate resources and tools individually. Fortunately Caspian comes to solve this problem. 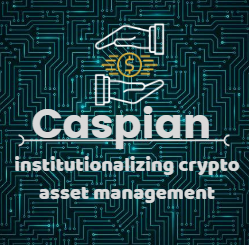 Caspian is a platform that comes to provide the solution to all investors and institutions that want to participate in the great world of cryptocurrencies, offering them a full range of tools so they can navigate quietly in the cryptographic space, having all the resources there, in real time. Caspian is the solution, you will no longer have to navigate through resources individually, since it offers you a whole range of tools. I made this graphic very simple but at the same time it is very attractive visually, the background represents the current technology that is present in our day to day, in the center I placed the name of the platform and below one of its slogans, also on top I placed a small image that represents the financial part. In my opinion, represents Caspian.